A very warm welcome to our new children and families in Apple Tree. 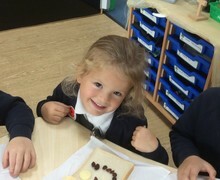 We have already had a very exciting start to the new school year and your children have settled very quickly. 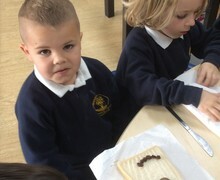 We will keep this page updated with news and images of our learning. We will begin our home learning later in the year. 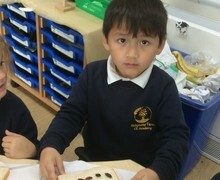 This term, in Apple Tree, we have been learning the story ‘We’re Going on a Bear Hunt’. 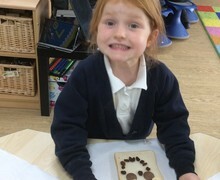 We have been busy making posters to find the bear, learning the story map and even found bear prints in our classroom! Today, we went out on a bear hunt: through the grass, through the river, through the mud, through the forest, through the snow storm and found a cave – WITH A BEAR! 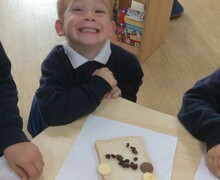 We quickly ran away but then when we went back to class, we noticed that the bear looked sad so we decided to use our Ruby Power to help cheer him up with big hugs. 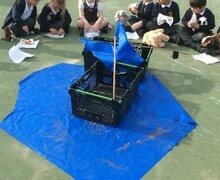 We are hoping that the bear stays in our cave to play and learn with us next week! 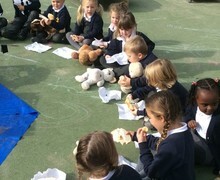 To end our Term 1 topic, our big bear created us a teddy bear picnic! 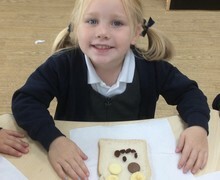 We made our own tasty sandwiches, focusing on healthy eating choices, hygiene and safety when chopping. 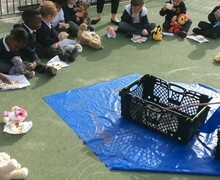 We also brought our own bears in from home and we played some party games. 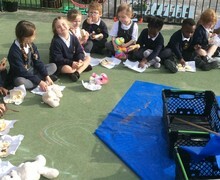 Thank you families for letting us bring in our bears, we had a super afternoon! Apple Tree were visited by Tudor, our school Vicar from Lydiard Millicent Parish. He came to talk to us about Christmas for Christians and told us the Bible story of the Nativity. We love it when Tudor brings his puppets to Collective Worship and we were in luck as he brought them with him! The children came to realise that the story Tudor was telling was the same as the nativity EY and KS1 were telling in our performance and every now and then broke into a song that linked to the part of the story he was telling. Thank you Tudor for coming to our class to teach us the Christmas story, we had a brilliant time and would love to have you come back another day. 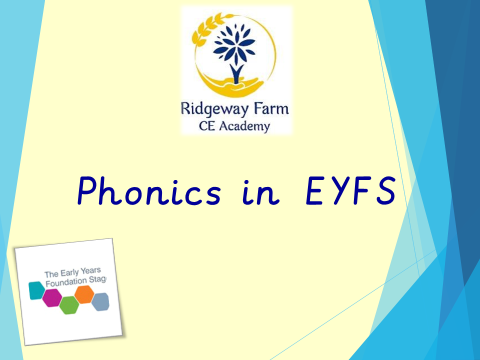 Please click the image below for the powerpoint information for Early Years Reading, Writing and Mathematics. In Term 3, we had Farmer Ali come to visit us in school! Our topic was all about ‘Growing’ and we had been learning about farms and the story of the ‘Little Red Hen’. Farmer Ali came in to talk to us about his job and what he gets up to on the farm. He brought in lots of things for us to see and touch like wool from his sheep and hay. 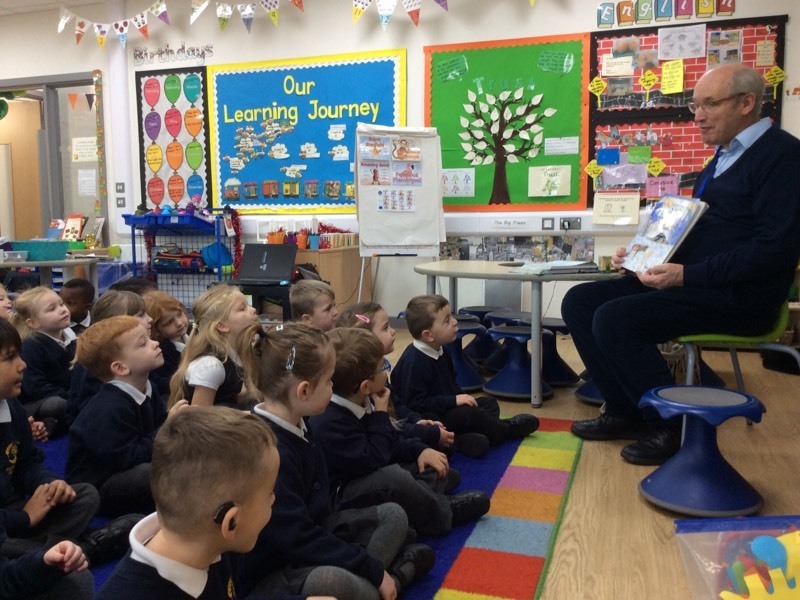 The children had so many questions for him that he ended up staying for a whole hour! Once he had gone, we decided to make him some thank you cards to send off to the farm to show our appreciation for him spending his time with us. Thanks Farmer Ali! To finish our topic in Term 4, we invited our parents in for an open session to bake bread! We had been learning the story ‘The Little Red Hen’ and so we re-told our families the story using our Talk for Writing and Kung Fu Punctuation! 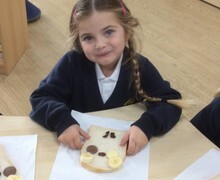 Our families then got busy helping add ingredients for our bread rolls. 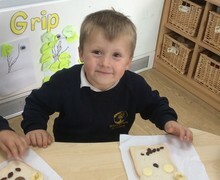 As we had some time before the families had to leave, we decided to do an impromptu dough disco using our bread dough! The children (and parents) loved it! What a great way to end our open session! The children then took their bread roll dough home to cook up and we have seen some super pictures of you baking your bread at home using the ILD! Thank you families for joining us. This term’s learning has been based around ‘Space’ and we CRASHED into our theme with a BANG. 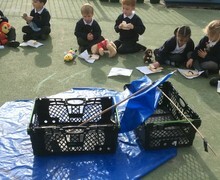 The children came in from lunch to discover a huge mess in our outdoor area. After closer inspection, they found that there was green slimey sludge left in footprints and we suspected something had been about! One of the children said “don’t worry, we can look at the cameras to find out what has happened here!” So, the next day, we did just that and found a video of an alien crash landing!! Since then, the alien has been giving us notes and stories each week to keep us hooked into our topic! Keep your eyes open for the little alien – his name is Tobfog!